A decade ago, I spent Easter in Damascus. Big chocolate bunnies and baskets of pastel eggs decorated shop windows in the Old City. Both the Catholic and Orthodox Easters were celebrated, and all Syrians were given time off for both three-day holidays on sequential weekends. I stopped in the Umayyad Mosque, which was built in the eighth century and named after the first dynasty to lead the Islamic world. The head of John the Baptist is reputedly buried in a large domed sanctuary—although claims vary—on the mosque’s grounds. Muslims revere John as the Prophet Yahya, the name in Arabic. Because of his birth to a long-barren mother and an aged father, Muslim women who are having trouble getting pregnant come to pray at his tomb. I watched as Christian tourists visiting the shrine mingled with Muslim women. Syria’s Christians are part of a mass exodus taking place throughout the Middle East, the cradle of the faith. Today, Christians are only about four per cent of the region’s more than four hundred million people—and probably less. They “have been subject to vicious murders at the hands of terrorist groups, forced out of their ancestral lands by civil wars, suffered societal intolerance fomented by Islamist groups, and subjected to institutional discrimination found in the legal codes and official practices of many Middle Eastern countries,” as several fellows at the Center for American Progress put it. Last weekend, suicide bombings in two Egyptian Coptic churches in Alexandria and Tanta, sixty miles north of Cairo, killed almost four dozen Egyptians and injured another hundred. The Palm Sunday attacks, coming just weeks before Pope Francis is due to visit the country, led the Coptic Church to curtail Easter celebrations in a country that has the largest Christian population—some nine million people—in the Middle East. A pillar of the early faith, the Copts trace their origins to the voyage of the Apostle Mark to Alexandria. “We can consider ourselves in a wave of persecution,” Bishop Anba Macarius, of the Minya diocese, who survived an assassination attempt in 2013, said on Thursday. The ISIS affiliate in the Sinai Peninsula claimed credit for the attacks. In the past two years, it has carried out a series of gruesome killings of Christians, including the forced march of twenty-one Egyptian workers in Libya, all Coptic Christians, each clad in an orange prison jumpsuit, to a Mediterranean beach, where they were forced to kneel and then beheaded. ISIS threats against Christians have escalated since a suicide bombing on December 11th at St. Mark’s Cathedral, in Cairo, killed more than two dozen Egyptians. After a February attack that killed seven Christians on Egypt’s Sinai Peninsula, the majority of Copts have fled the Sinai, according to Human Rights Watch. The largest exodus of Christians is in Iraq, where the group has been trapped in escalating sectarian clashes between Sunni and Shiite Muslims, targeted by an Al Qaeda franchise, and forced to flee by the Islamic State. “There were 1.3 million Christians in Iraq in 2003. We’re down by a million since then,” with hundreds more leaving each month, Bashar Warda, a Chaldean bishop in the northern city of Erbil, the Kurdish capital, told me last month. He was wearing a pink zucchetto skullcap and an amaranth sash tied around his black cassock. A large silver cross hung around his neck. Last month, I drove to Mosul, Iraq’s second-largest city and home for two millennia to one of the world’s oldest Christian communities. Within days of its conquest of Mosul, isis issued an ultimatum to Christians to either convert to Islam, pay an exorbitant and open-ended tax, or face death “by the sword.” Homes of Christians were marked by a large “N” for “Nassarah,” a term in the Koran for Christians. Some thirty-five thousand Christians fled. Many of their homes were ransacked and then set alight. En route to Mosul, I passed other Christian villages, like Bartella, that had also emptied. Even gravestones at the local cemetery were bullet-ridden. In all, a hundred thousand Christians from across the Biblical Nineveh Plains are estimated to have abandoned their farmlands, villages, and towns for refuge in northern Kurdistan—or beyond Iraq’s borders. “For the first time in the history of Iraq, Mosul is now empty of Christians,” the Chaldean Patriarch Louis Sako told Agence France-Presse. In Erbil, fifteen hundred Christian families displaced by isis now live in shipping containers converted into temporary homes in Ashti-2, a teeming camp with narrow dirt roads. Outside the camp, I met Salam Ablaha, a thirty-six-year-old grocer. An Assyrian Christian, he fled Hamdaniya, near Mosul, in August, 2014. He now runs an open-air stall that sells green apples, tomatoes, mushrooms, lemons, and carrots stacked high on crates. He had a light beard and was wearing a black fleece jacket to ward off the spring chill. His extended family of twenty-six—his wife, three children, parents, and the families of seven brothers—live off the charity from the Iraqi Assyrian Church and his modest earnings. Like many Christians I interviewed, Ablaha has no intention of returning to Hamdaniya. Since the city was liberated, last October, he’s been back once to check on his home. The furniture was gone; so were the windows and doors. “None of us want to go back,” he told me. “We’re still scared of what will happen after isis.” There’s a widespread fear among Christians about the emergence of a third iteration of Islamic extremism—after the rise of an Al Qaeda affiliate, a decade ago, and isis, during the past three years. Ablaha’s brother was kidnapped by Al Qaeda in 2007; he was freed only after the family paid a hefty ransom. Iraq, Syria, and Egypt are part of the Arab world. But even in “black” African and “white” European nations with Muslim majorities, Christians are fleeing. In Mali, after a 2012 Islamic coup, as many as 200,000 Christians fled. According to reports, “the church in Mali faces being eradicated,” especially in the north “where rebels want to establish an independent Islamist state and drive Christians out… there have been house to house searches for Christians who might be in hiding, churches and other Christian property have been looted or destroyed, and people tortured into revealing any Christian relatives.” At least one pastor was beheaded. In the Ivory Coast—where Christians have literally been crucified—Islamic rebels “massacred hundreds and displaced tens of thousands” of Christians. In Libya, Islamic rebels forced several Christian religious orders, serving the sick and needy in the country since 1921, to flee. To anyone following the plight of Christians under Islamic persecution, none of this is surprising. As I document in my new book, “Crucified Again: Exposing Islam’s New War on Christians,” all around the Islamic world—in nations that do not share the same race, language, culture, or economics, in nations that share only Islam—Christians are being persecuted into extinction. Such is the true face of extremist Islamic resurgence. Update (April 10th 2017): The chart in this article has been updated to reflect more recent data. It is easy to see why the pope is so downhearted. Look no further than Bethlehem, where young Palestinians throw stones at Israeli soldiers manning the wall separating the West Bank from Israel. From afar, the Israeli tear gas looks like the smoke from frankincense, of the sort that pilgrims burn when visiting the Church of the Nativity. But there were few pilgrims this Christmas—they were too scared. Most victims of war and terrorism in the Middle East are Muslims, since they are by far the majority of the population. But the tiny Christian minority often feels singled out. Their numbers are declining where the fighting is worst (see chart). 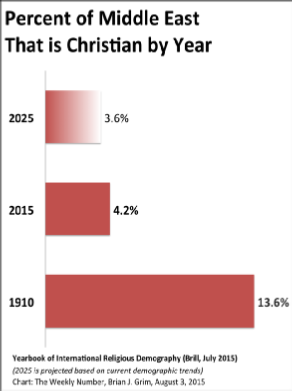 Overall, the proportion of Middle Easterners who are Christian has dropped from 14% in 1910 to 4% today. Church leaders and pundits have begun to ask whether Christianity will vanish from the Middle East, its cradle, after 2,000 years. An exodus is under way. Many Christians feel more at home in the West and have the means to get there. Some are leaving because of the general atmosphere of violence and economic malaise. 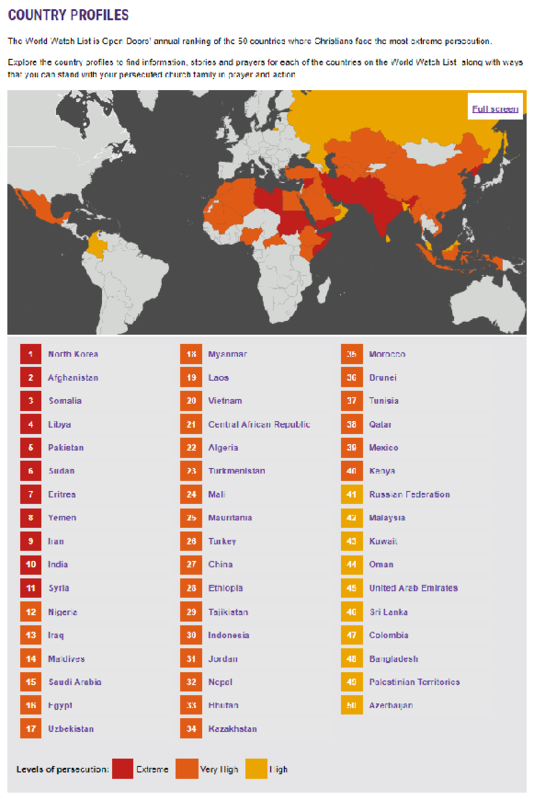 Others worry about persecution. A recent video of three Assyrian Christians in orange jumpsuits being made to kneel before being shot in the head by Islamic State (IS) jihadists fuelled this fear—though IS treats many other groups equally badly. The Christians who remain tend to have fewer babies than their Muslim neighbours, according to the Pew Research Centre. Regional data are unreliable, but in Egypt the fertility rate for Muslims is 2.7; for Christians it is 1.9. Mosul, in northern Iraq, was once home to tens of thousands of Christians. Perceived as supporting the Americans, they were targeted by insurgents after the invasion. A wave of killings in 2008, including that of the local Chaldean archbishop, seemed to mark the low point for the community. Then came IS. When the jihadists entered the city in 2014, they reportedly tagged Christian houses with an “N” for “Nazarene”, and gave their occupants a choice: convert, pay the jizya, a tax on non-Muslims, or face possible death. Most fled. In July 2014 IS announced that the city was free of Christians. Many who left Mosul went to Erbil, the Kurdish capital of northern Iraq, where they have trouble finding work or obtaining public services. Even there, some refugees chafe at the enforcement of Muslim customs. “You wouldn’t want to live there,” says Samir, a Christian refugee now in Lebanon. In general, Christians complain that their Muslim neighbours are growing increasingly intolerant. Some retort that Westerners exaggerate tales of Christian persecution to justify interventionist policies. “There is talk as if the West is genuinely interested in Christians, but most of the time they only use them for their own political ends,” says Mitri Raheb, pastor of a church in Bethlehem. He says that the Israeli occupation hurts Palestinian Christians far more than persecution by Muslims, but provokes less outrage in the West. Christian leaders are in a tough spot. “I cannot preach to people: ‘Do not leave,’” says Father Raheb. But other priests have. In an open letter published in September one of Syria’s most senior Catholic leaders, Melkite Patriarch Gregory III, wrote: “Despite all your suffering, stay! Be patient! Don’t emigrate! Stay for the church, your homeland, for Syria and its future!” Rankling many, he then urged Europe not to “encourage Syrian Christians to emigrate”. A refugee from Mosul says the pleas go “in one ear, out the other”. Christian leaders have often supported whichever strongman is in power. The late Pope Shenouda III, head of the Coptic church, the largest in the Middle East, backed Hosni Mubarak, Egypt’s former dictator, and discouraged Copts from joining the protests that would eventually topple him. In 2012 Shenouda was succeeded by Tawadros II, who supports the current strongman, Abdel-Fattah al-Sisi. He has described the Arab spring as being more like a “winter, plotted by malicious hands” in order to break up the region into smaller states. Yet the Copts have gained little from their leaders’ loyalty. Mr Mubarak stood by as relations between Christians and Muslims deteriorated and sectarian violence increased. Mr Sisi is seen as better than the Islamist government that he toppled. A draft law would make it easier to build churches. But Copts are still expelled from villages for such crimes as falling in love with a Muslim. Even in Lebanon, where Christians were once a majority and still hold considerable power, their political leaders have disappointed. Under the country’s unique system, government posts are shared out based on sect. The presidency goes to a Maronite, the largest group of Christians. But in recent decades many Christians have left. Muslims are now a majority, and want power to match their numbers. Christian political leaders complain of persecution, but many seem more concerned with enhancing their own power. Bickering between politicians has left the presidency vacant for 18 months. Oddly enough it is the Gulf, home to the most conservative brand of Islam, which has welcomed the largest number of Christians recently, though not from Iraq or Syria. A wave of migrant labourers from the Asia-Pacific has dramatically increased the share of Christians in countries such as Saudi Arabia and the United Arab Emirates (UAE), which had few before. Tolerance varies between countries. Saudi Arabia, for example, bans the practice of Christianity (though many Christians worship in private). The UAE restricts proselytisation, but has otherwise supported its Christians. The number of churches in the country has grown from 24 in 2005 to 40 today. The emirate’s rulers often provide churches with free land, water and electricity. But these new Christian enclaves may not last. Migrant workers in the Gulf cannot easily become citizens or put down roots. In any case it is the loss of ancient communities that most concerns church leaders. “Christians are not guests in the Middle East,” says Father Paul Karam, the president of Caritas, a Catholic charity, in Lebanon. “We are the original owners of the land.” But none of the Christian refugees who spoke with your correspondent plans to return home. “We don’t belong there,” says Samir, who expects Iraq soon to be empty of Christians altogether. Saudi Arabia, America's close friend and ally, failed to live up to its promise to eliminate extremist content -- that promotes hostility for, and violence against, religious minorities -- from its 2018-19 school year curriculum. Report from International Christian Concern, December 1, 2018. The Independent, December 24, 2018.
face the most extreme persecution? MASS CHRISTIAN EXODUS FROM PAKISTAN & MIDDLE EAST! The majority of Iraq's Christians have fled the predominantly Muslim country as the Islamic State occupied their towns in and around Mosul. 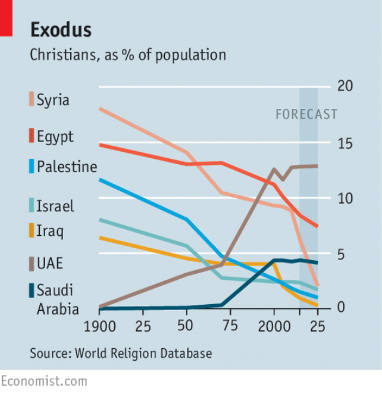 Christians have lived in the region since the start of Christianity itself, but today they number less than 250,000. NewsHour Weekend Special Correspondent Christopher Livesay reports on how they are coping in the war-torn country.